Rivers Shut Down Over EPA's Spill Of 3 Million Gallons Of Toxic Water : The Two-Way Water samples taken after the spill showed lead concentrations that were 3,500 times the levels normally seen in Durango, Colo.
As it monitored the wastewater blowout that began Wednesday, the EPA took this photo of a sampling point near the source outside Silverton, Colo., on Sunday. In Colorado, New Mexico and Utah, towns that are downstream from the old gold mine where contaminated wastewater spewed into a river have shut off their water supplies' connections to the spill. Two rivers will remain closed until at least Monday, officials say. The spill began last Wednesday, when an EPA cleanup team used heavy equipment to breach a dam at an abandoned mine in Colorado. The team inadvertently released an estimated 3 million gallons of water laden with heavy metals and contaminants into a creek that flows into a river above Durango, Colo.
"The orange plume of wastewater leaked from the Gold King Mine in southwestern Colorado down the Animas River into New Mexico's San Juan River," Colorado Public Radio's Grace Hood reports. She adds that seven public water supply systems have been shut off in Colorado and New Mexico. "It is really a tragic and very unfortunate incident," EPA Administrator Gina McCarthy says, "and EPA is taking responsibility to ensure that that spill is cleaned up." She added that "the most important effort that we are ensuring right away is the health and safety of the residents and the visitors near that river." McCarthy said, "there are thousands of abandoned mines throughout the West, and EPA routinely works with states to clean up these spills." The EPA leader spoke about the spill at an event at which she was scheduled to discuss her agency's role in the Obama administration's recently unveiled "Clean Power Plan." Water samples taken after the spill showed lead concentrations in some places that were 3,500 times the normal levels in and around Durango. The wastewater also contained manganese, zinc, copper and cadmium, along with other contaminants. Health officials have urged farmers and those who use affected rivers and lakes for recreation to avoid the water. For cities and farms, the ban is forcing them to use other sources or pull from reserves. In some areas, the EPA is supplying water for livestock. The spill turned rivers that are normally a blue-green color into a cloudy orange, triggering a flurry of posts on Twitter and Facebook — many of which also vented anger at the EPA over the conditions on waterways that are frequently used for kayaking and trout fishing. By Monday afternoon, some photos from the Animas River seemed to show some dissipation, aided by the EPA's introduction of clean water upstream and the use of large holding pools to contain the toxic water. The EPA's regional administrator, Shaun McGrath, says that while no health issues have been found so far, "We're going to continue to monitor that situation, because there could be some impacts that occur over time." The plume is now working its way toward the San Juan River's confluence with the Colorado River in Utah. The contaminants have been settling to the ground, the EPA says. But many believe the wastewater might make it to Lake Powell, on the Utah-Arizona border. "Two Navajo Nation towns along the San Juan River in Utah have already shut off their water systems and have water trucks standing by," NPR's Howard Berkes reports. "Navajo tribal officials have declared a state of emergency. Two other towns downstream use wells instead of river water, but state officials are monitoring those wells." "There's certainly concern, certainly a lot of outrage over the fact that it's happened and especially that the EPA, who's responsible for taking care of these kinds of things, is the one that caused it. In general, I think they understand that they can work through it. There's so many challenges that students down in this area face anyway, and the people who live here, and to have something like this layered on top of that just doesn't seem fair. We would hope that they would be cautious and recognize how a river is such a lifeblood to these people down here." In its latest update on the spill, the EPA said it is taking responsibility for the spill and its effects. The agency says people who want to file claims for damages can begin to do so today. 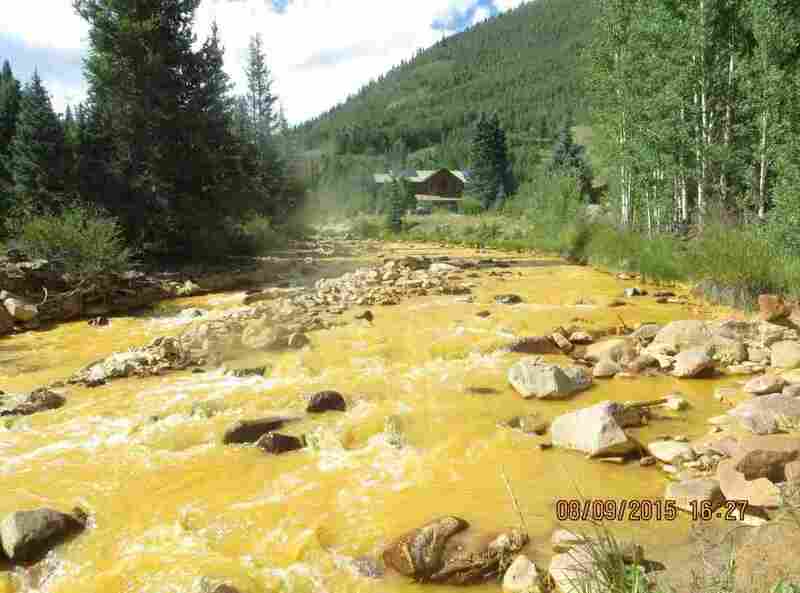 While the incident has opened the EPA to criticism — especially by those who say the agency waited too long to publicize the spill — others note that the area near Silverton, where the breach occurred, has many abandoned mines that hold toxic water. Member station KUNC notes, "Scientists say it's the largest untreated mine drainage in the state, and problematic concentrations of zinc, copper, cadmium, iron, lead, manganese and aluminum are choking off the Upper Animas River's ecosystem."